Update: $55 Athlon 200GE confirmed. AMD is preparing to unveil four new Pro-class processors across its Ryzen and Athlon brands according to leaked slides published by VideoCardz. 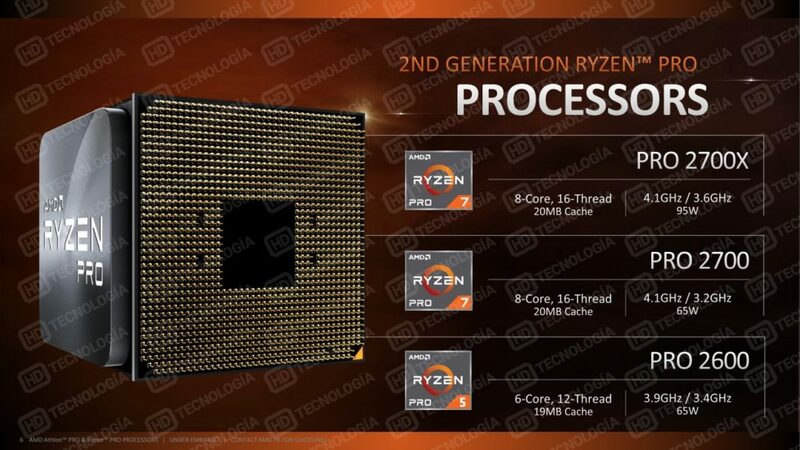 The new Ryzen chips include the Ryzen 7 Pro 2700X with eight cores / 16 threads, a base clock of 3.6GHz and a turbo clock of 4.1GHz, the Ryzen 7 Pro 2700 which features eight cores / 16 threads, a 3.2GHz base clock and a 4.1GHz turbo clock and the Ryzen 7 Pro 2600 with six cores / 12 threads, a base clock of 3.4GHz and a turbo clock of 3.9GHz. The Ryzen 7 Pro 2700X carries a TDP of 95W while the other two check in at 65W. The Athlon Pro 200GE, meanwhile, is a dual-core / four thread part with a base clock of 3.2GHz and a TDP of 35W that also has integrated Radeon Vega graphics. 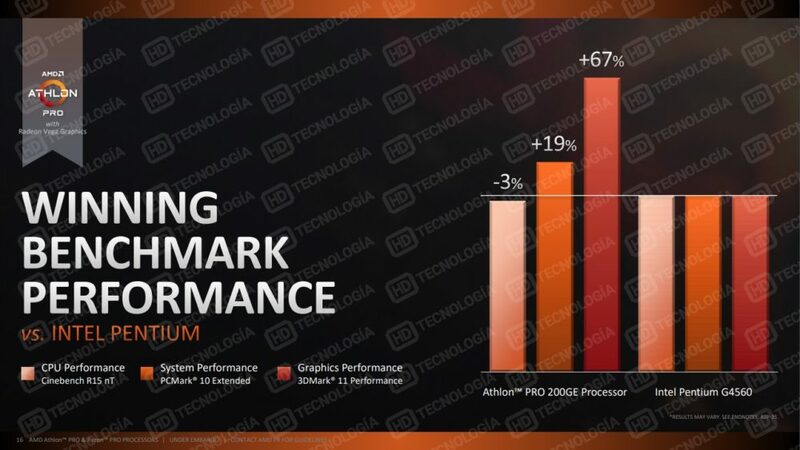 It’s an entry-level CPU meant to compete with Intel’s Pentium G4560 and according to AMD’s internal benchmarks, it’s 19 percent faster than its competition in PCMark 10 and 67 percent faster in 3DMark 11 (its CPU performance is three percent slower, however, in Cinebench R15). AMD’s Athlon 200GE is expected to be unveiled on September 6 (tomorrow) and go on sale on September 18 at a suggested price of $55. No word yet on the reveal / launch dates for the Ryzen Pro chips. Color me confused. Not sure why you launch a new set up chips, lower the clock speed and TDP and then call them Pro... I hope there is more to this story to be released at a later time. They will likely be quantity priced and more for enterprise situations - normal PCs in office without need for high power / gaming / etc. Looks to be aimed squarely at the Intel mainstream office PC platforms, to try to sneak into that market and maybe get a little slice of the pie. I need a cheap laptop upgrade for work. Something better than an AMD A6-7310 for $300. It also needs to be easily upgradable with a HD/SSD and memory. Having to tear apart the whole backing just to upgrade the memory and drives is ridiculous in this day and time and not customer friendly.